“Moose” Gr RT Ch Reveirter Swan Hill was born on 10 October 2007 and commenced his retrieving trial career in a Novice Stake at the Golden Retrieving Club of Victoria at Tabilk on 28 February 2009 at 18 months of age. Moose’s Novice Stake career was a short one winning his way out of novice by winning two Novice Stakes at the Central Highlands Working Gundog Club Easter Trial in 2009. From an early age Moose showed a great propensity to run very straight lines and tackle most obstacles in his stride. The ability to run very straight lines probably held Moose’s marking ability back as he was most times able to get marks by running straight on to the bird. Moose’s career in Restricted Stakes was similarly short winning his way out of Restricted by gaining his Restricted Retrieving Dog title after six starts at that level. This was interspersed by two starts in All Age to get the feel of the standard required. Moose was able to gain his first win in all age after nine All Age Stake trials at the Labrador Retriever Club of South Australia Trial at Morgan, South Australia on 2 May 2010 and the age of two and half years. It took Moose another 8 months to get his title of Retrieving Trial Champion at the age of three years three months by winning an All Age at the Victorian German Shorthaired Pointer Club Trial at Sale on 23 January 2011. In between times Moose had completed three of the first four Championship Stakes in which he had been entered gaining placing's in two of these events. 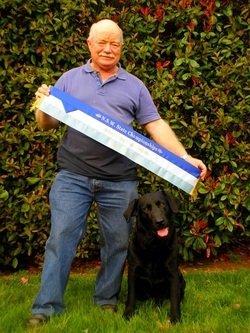 Before Moose had turned five he had won another four All Age Stakes and won the 2011 New South Wales Retrieving Trial Championship at Jugiong on 3&4 September 2011 against 33 competitors. By winning the All Age at the Labrador Retriever Club of South Australia retrieving trial conducted on 25 July 2015 under judge Mr Jeff Patrick, Moose had gained sufficient championship points (120) to be awarded the title of Grand Retrieving Trial Champion. The following weekend Moose completed and won the South Australian State Championship. Up until the end of 2016 in All Age Stake Trials Moose had won 21 All Age Trials was placed second 25 times and third 9 times. In Championship Stakes Moose has had a total of seven placing's including winning the NSW State Retrieving Trial Championship in 2011 under judges Mr Bill Hepburn (Tas) and Mr Joe Vella (NSW) and the South Australia Retrieving Trial Championship in 2015 under judge Mr Allen Bartram (WA). 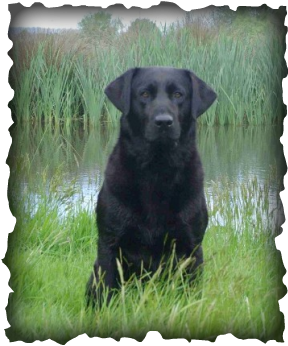 Moose has also placed second in the National Retrieving Trial Championship conducted in South Australia in 2014, completed another national in 2011 and placed second in the 2015 Victorian Retrieving Trial Championship. Up until the end of 2016 “Moose” has gained a total of 168 championship points. Moose is also now serving in another role being a service and therapy dog at schools for the disabled a duty he loves. Retrieving Trial Champion Reveirter Swan Hill “Moose” was born on 10 October 2007 and commenced his retrieving trial career in a Novice Stake at the Golden Retriever Club Trial conducted at Tabilk on 28 February 2009 at 18 months of age. Moose Novice career was short one winning his way out of Novice by winning two Novice Stakes at the Central Highlands Working Gundog Club Easter Trial in 2009..
From an early age “Moose” showed a great propensity to run very straight lines and tackle most obstacles in his stride. The ability to run very straight lines probably held “Moose’s” marking ability back as he was most times able to get marks by running straight on to the bird. “Moose’s” career in Restricted Stakes was similarly short winning his way out of Restricted by gaining his Restricted Retrieving Dog title after six starts in restricted. This was interspersed by a couple of starts in All Age to get the feel of the standard required. Moose was able to gain his first win in All Age after nine All Age Trials at the Labrador Retriever Club of South Australia Trial at Morgan, South Australia on 2 May 2010 and the age of two and half years. It took “ Moose another 8 months to get his title of Retrieving Trial Champion at the age of three years three months by winning an Age Stake at the Victorian German Shorthaired Pointer Club Trial at Sale on 23 January 2011. In between times “Moose” had completed three of his first four Championship Stakes he had competed in gaining places in two of these events. By the time Moose had turned four he had won another three All Age Stakes and won the 2011 New South Wales Retrieving Trial Championship at Jugiong on 3&4 September 2011 against 33 fellow competitors. By the time Moose had turned four years of age his results in All Age Stakes included 5 wins, 4 seconds and 3 thirds, together with a first, third and fourth in Championship Stakes from 9 starts at Championship level.